Sun Infosys Technologies said it has secured a major contract from Al Nuaimi Group, a leading construction conglomerates in the UAE, to deploy its eresource Nfra enterprise resource planning (ERP) system. The Emirati arm of India-based Infotech, Sun Infosys Technologies is a leading provider of ERP software for construction and contracting industry in the region. Within a span of just two years of launching its Dubai office, the company has secured a good clientele in infrastructure, manufacturing, trading, pharmaceuticals, logistics, said the company in a statement. Sun Infosys Technologies pointed out that the UAE was one of fastest growing ERP markets in the Middle East today as modernisation initiative continues in every industrial sector to increase international competitiveness. Today businesses understand that services and solutions like ERP can help them achieve their objectives while carving a niche for themselves in their market space. This results in the rise of software sales in the region, said a top company official. 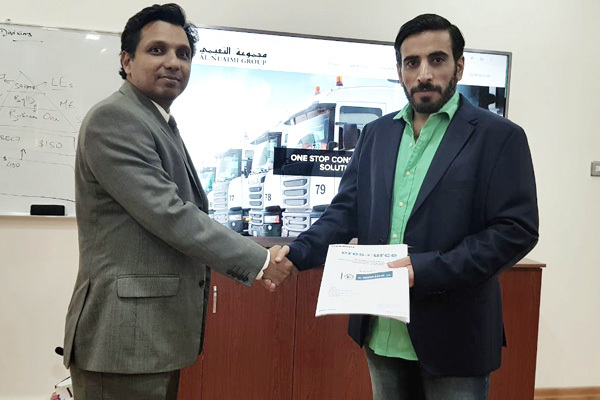 "One of our high-demand products, Nfra ERP system has been explicitly designed for the infrastructure and project-based industries and is already making waves in ERP market in the UAE," remarked Sudheer Nair, the chief executive of eresource. "Nfra is a sophisticated ERP tool that has been designed for project-based industries, oil and gas, construction, MEP (mechanical, electrical and plumbing) contracts, architects, infrastructure development and EPC contractors," he stated. According to him, Nfra ERP has become a boon for construction companies as all activities right from pre-construction to the post-construction stage can be captured and monitored. "Today more and more organisations from project-based industries are implementing ERP system for easy and quick business operations," he added. On the partnership, Al Nuaimi Group CEO Dr Rashed Al Nuaimi said the eresource Nfra ERP system provides us the freedom to move ahead with the changing business environment. "One major advantage is that our management can access and manage onsite activities from anywhere anytime. Independent estimates can be generated for each task based on respective quantities. Also, estimating is facilitated by system-prompted activities," he stated. "All different activities can be defined as different assemblies. Associated with each assemblies are bills of quantities, labour, and turnaround time for completion. With the implementation of eresource Nfra ERP systemm we are in the process of upgrading our system from the existing one as we thought that this is the right time to step further and move ahead with the changing business environment," he added. Sanjith Menon, the strategic business unit head, eresource ME wing, said: "While developing the ERP for the construction Industry, core functional areas such as project monitoring and control, sales management, tendering, bill of quantities, onsite engineers portal, accounts and human resource management have been given extra care and prominence."